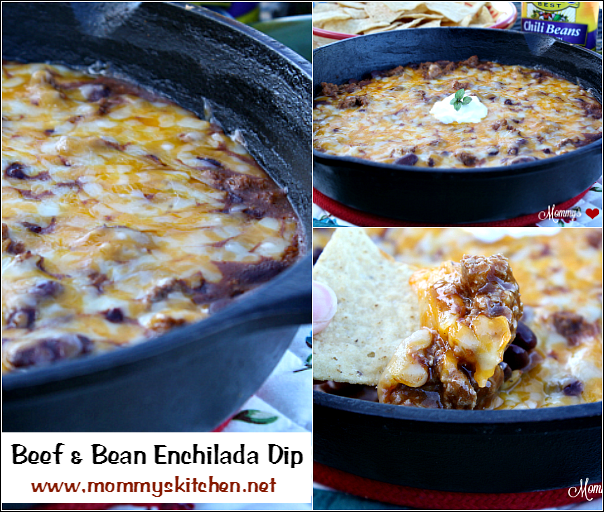 Everything you love about beef and bean enchiladas in a quick and easy skillet dip recipe. Happy almost New Year!!! Since tonight is New Years Eve dinner will be all about a variety of appetizers, finger foods, portable snacks and dips. I guess you could say I'm making a little of everything to please all my guests. I have my triple crock pot on the counter simmering away with a meaty queso cheese dip, barbecue little smokies and a hot corn dip. I'm also serving ham and cheese sliders, hot wing drumsticks, maple sausage balls, a fruit tray and this Beef and Bean Enchilada Dip. 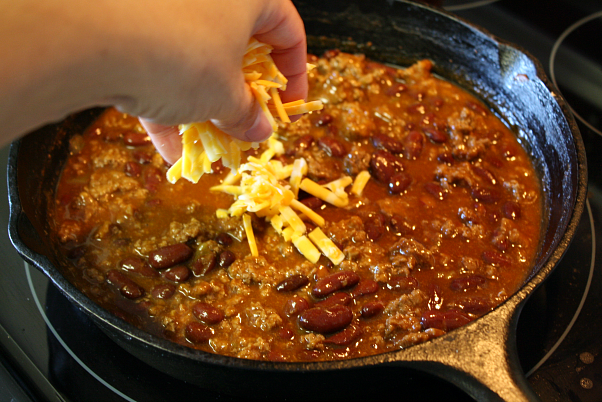 This quick and easy dip has everything you love about enchiladas in a warm ooey-gooey dip filled with ground beef, chili beans, and cheese. 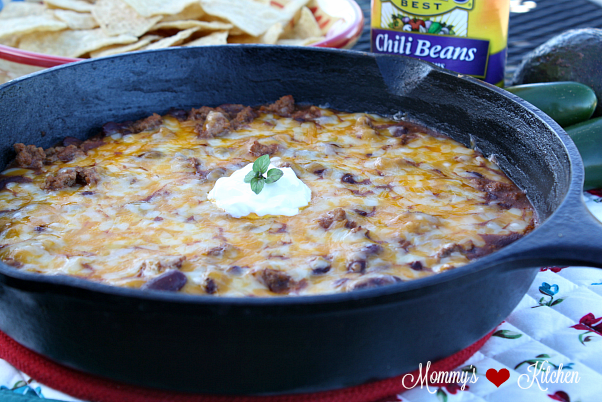 I used Bush's Kidney Chili Beans to make this dip, but I think Black bean chili beans or Pinto chili beans would work just as well in this recipe. 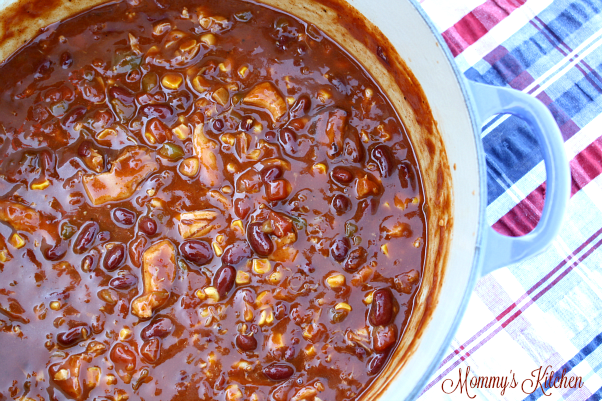 Have you seen the new Bush's Chili Bean Varieties? I've been using Bush's original chili Pinto beans for as long as I can remember, so I was pretty excited when Bush's expanded their chili bean line with three new bean varieties. Each one is simmered in a mild chili sauce with the perfect blend of chilies, spices, garlic and onions. 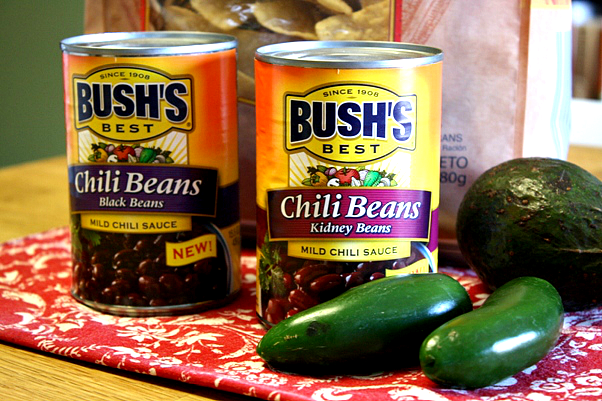 Bush's new chili beans are perfect for casseroles, chili, dips, nachos, soup, stew, chowders and more. 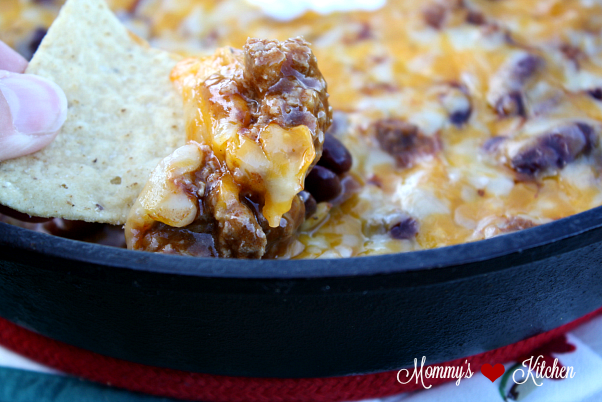 I hope you'll give this dip recipe a try at your next potluck, party or football get-together. Have a happy and safe New Year everyone!!! Now let's get started on this easy recipe. Over medium heat, brown the ground beef in a medium size skillet, breaking up the meat as it cooks. Add the chopped onion and garlic and cook until the onion is translucent and the ground beef is cooked through. Drain off any grease. Drain the green chiles and add to the meat mixture. Add the seasonings, enchilada sauce and chili beans. Stir to combine. Bring the mixture to a boil, reduce heat to low - med and simmer until the mixture cooks down (about 10 minutes). 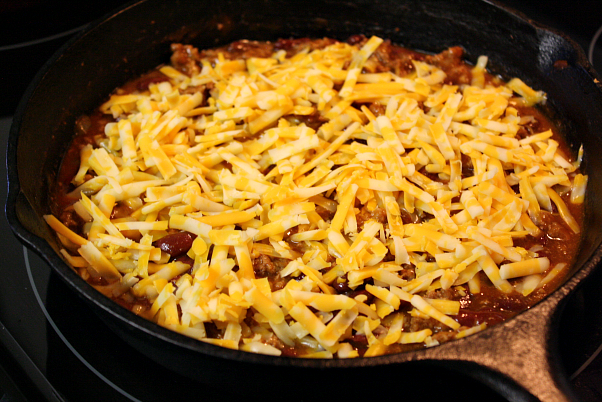 Sprinkle the cheese on top and cover skillet for 10 minutes (leave the burner on low). Uncover and serve immediately with tortilla chips for dipping. 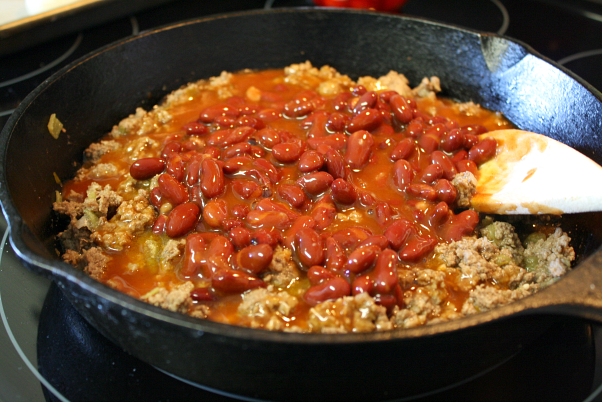 Over medium heat, brown the ground beef in a medium size skillet. Break up the ground beef as it cooks. Add the chopped onion and garlic and cook until the onion is translucent and the ground beef is cooked through. Drain off any grease. Drain the green chilies and add to the meat mixture. 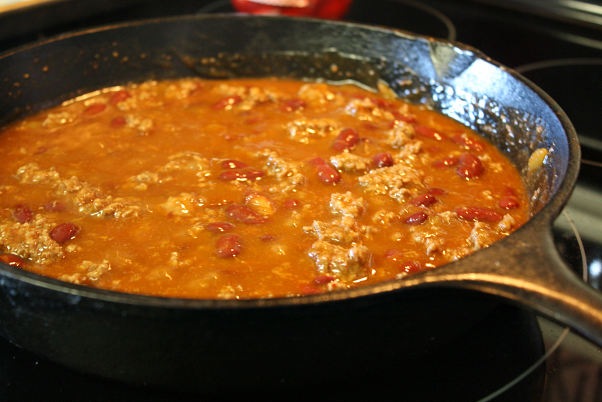 Add the seasonings, enchilada sauce and chili beans. Stir to combine. Cook's Note: If you love chicken enchiladas try bush's white chili beans, roasted chicken, a green chile enchilada sauce and Monterey Jack cheese to make a cheesy chicken enchilada dip. 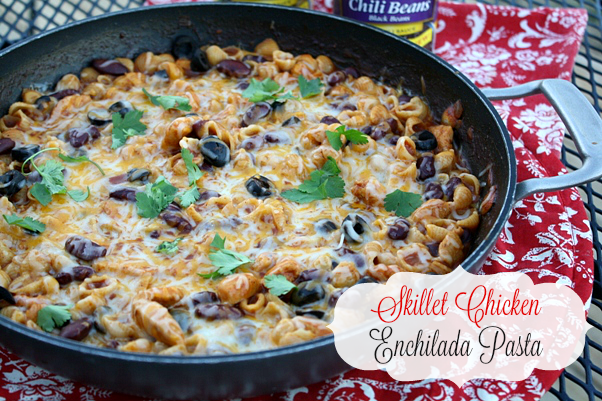 If you're looking for more ways to use Bush's Chili Bean's, check out this recipe for Barbecue Chicken Chili and Skillet Chicken Enchilada Pasta. Visit Bush's Beans for more recipe inspiration and follow along on Facebook, Twitter, Pinterest and Instagram!